Hello all! Glad to be here. I'm coming around mostly to try to find place to buy plans or a kit boat for something like the Aussie plate boats. Hoping to find something trailerable around 25' long with a closed cabin. Most use would be on Lake Superior and a couple bigger lakes here in MN (Lake of the Woods, Vermillion, Mille Lacs). Hoping to learn plenty and find a nice project for me to build out in the next year or two. russellmn, Welcome to the AAB.com Forum. You didn't mention it in your post so I'll ask for the Forum- do you already weld aluminum? Have some experience and equipment? and have you built a boat in the Miracle Metal before? Even cut kits require some fairly extensive metal working skills so unless you have some background; its an ambitious project to start with a 25'er and cabin!! Last edited by kmorin on Sat Apr 06, 2019 5:38 pm, edited 1 time in total. Sorry, yeah. I've built a couple mini jet boats with jet ski drivelines, some heavier al and I have some pretty good metal working and metalshaping skills. The toughest part for me will be the rigging/wiring. That's not a strong point for me. russellmn, that's a different story from a complete newbie biting off a 25'er!!! Specmar (PNW) http://www.specmar.com/ has cut kits in all sorts of models and variations of their designs. They're strong and tested and reliable, but I don't know if they sell a plans package- cut files usually add bit to the cost, however they do save time in the shop as layout and cutting are all done. 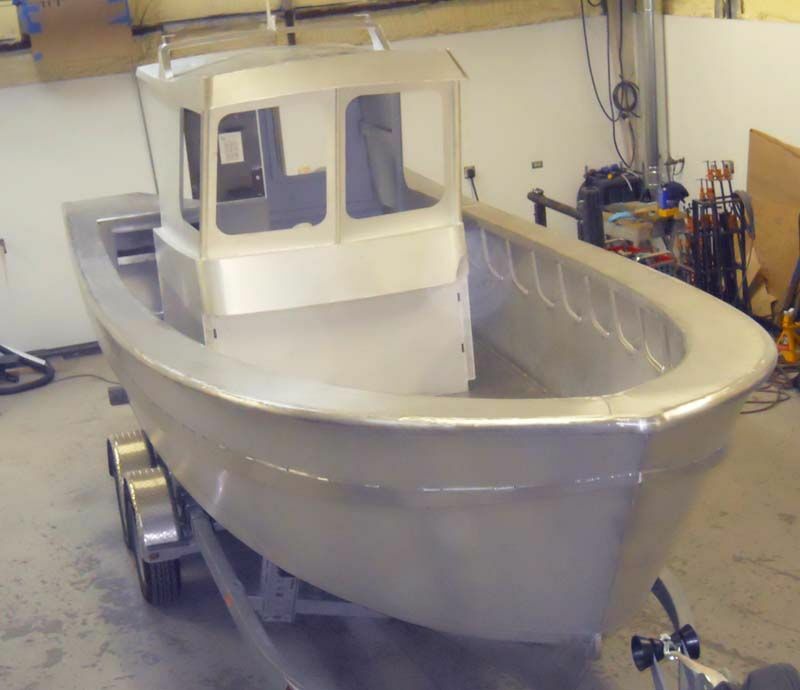 John Simpson on the Canadian coast, http://simpsonmarinedesign.com/, offers many different designs of welded aluminum but not sure if his catalog will include the model you're seeking. Bill Lincoln of Response Marine http://www.responsemarine.com/bkgd.htm has many designs and I'm pretty sure he'll have a design in the class and configuration you're looking for in your description. You might check out a thread here : http://www.glen-l.com/phpBB2/viewtopic.php?f=7&t=34367 a post of a build by the designer of this 25' welded aluminum, mid cabin, outboard powered skiff. Yofish (user name) does sell cut file designs, so there's another possibility if the lines appeal to you? Metal Boat Kits https://metalboatkits.com/ offers several designs in the class and configuration you've mentioned. My last 25'er in the shop was a walk around cabin model, 25' LOA, outboard powered with a sealed deck and fairly tall topsides. hard to get an amidships cabin to look sweet on a skiff, even if you lift the sheer up. Here, the skiff sits on the trailer outside that shop on a sloped driveway ramp. This class of skiff is very popular in the South Central Gulf coast of Alaska, being used in some of the larger lakes as well as bays and bights and even open ocean; in the season. Hope you'll keep us posted and if time allows post a build thread of your past jet boat work?